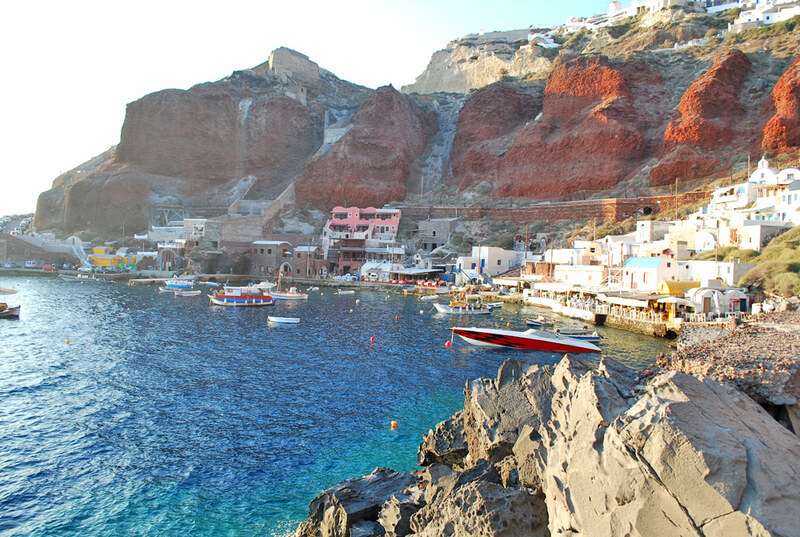 Oia village is located on the north part of Santorini island nad there some very nice beaches one can visit nearby. They can be reached by bus or even on foot even though it will be a long walk. Directing to the north west, one reaches a plain known as Baxedes were the habitants of Oia used to grow dry fruits and vegetables (that did not need watering) such as tomatoes, cucumbers, split peas, aubergines, carrots, baby courgettes, lettuces, small melons and water melons. The fact that they are not watered makes these vegetables which are cultivated even today at that area, makes them sweet and really delicious. Baxedes was named after the Turkish word “Baxes” that means “garden”. On the other side of the Baxedes, towards the north, the north coast of the island lies covered by black volcanic sand. The beach is also called. Visitors can enjoy swimming in a silent place as it is not very crowdy yet preferred by families with young children thanks to its sandy bottom and coast. There is a canteen on the beach and some traditional restaurants nearby. 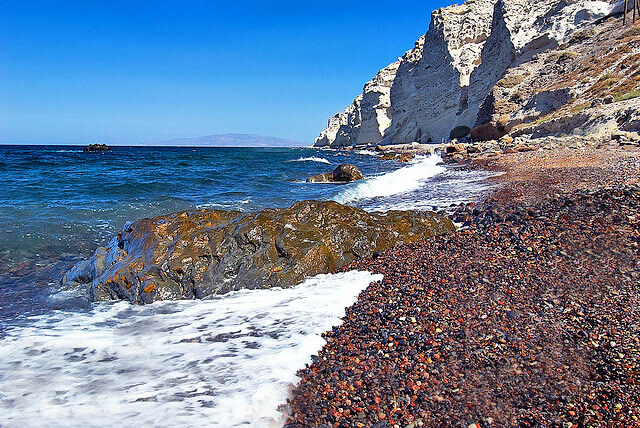 Koloumbos beach is located to the east of Oia village, not far away from Baxedes. Surrounded by a high cliff and covered by black pebbles, it offers an amazing landscape that has not been affected by tourism business such as deck chairs or beach bars. It is silent and naturally beautiful. 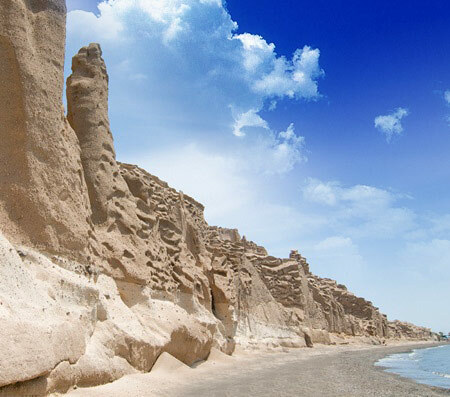 Once having arrived at the edge of the cliff over the beach, one can enjoy the view to the blue silent sea. A short path surrounded by thyme bushes leads visitors to the beach where they can relax at the shade created by the cliff. Far from the landscape, one can enjoy a magnificent sunset from Koloumbos beach. Located only one kilometer away from Oia village, it can be accessed on food during a hiking route in a desert like landscape composed of volcanic rocks. 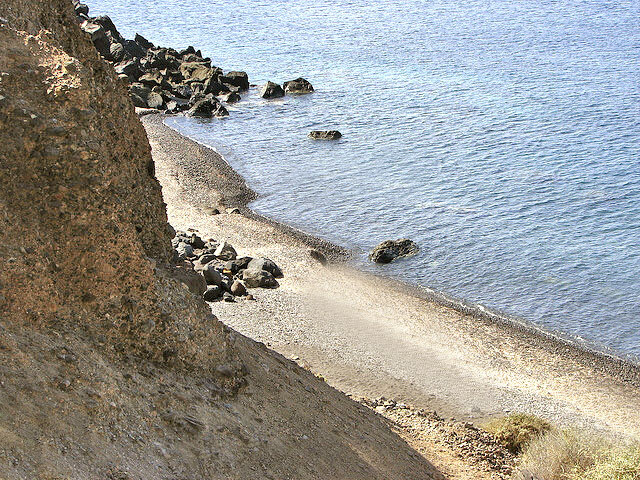 The beach is located to the west of Oia village from where one has to walk along the road to Ammoudi until the sign to Katharos, showing to the right, appears. There is a wide pathway to the beach covered of lava rocks crunching under peoples foot, lacking any kind of vegetation. It takes around 10 minutes walking to arrive at the left turning of the road from where descending to the beahc starts. It is a small uncrowdy beach from where one can see Therassia. The rocks around the beach seem to have been engraved by the wind power. 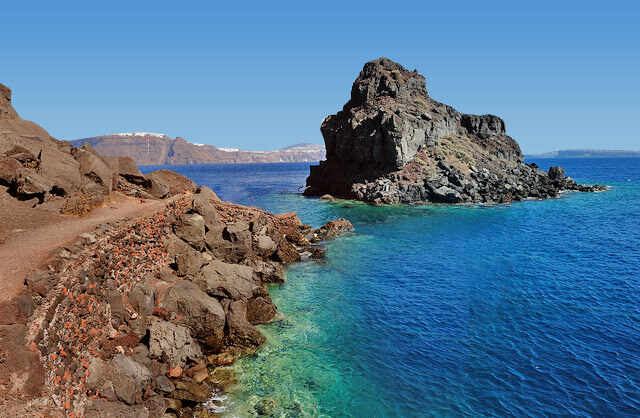 Katharos is an easily accessed beach and by the people who stay in Oia thus mainly preferred by them. There is a beach bar-restaurant which is open all night long during the summer. Ammoudi beach can be accessed either via the road (by car, mule, on foot) that leads to it or through the steps from Goulas, Oia. In the first case it takes 20-25 walking along the paved road to arrive at the bottom of the cliff. The route included a pretty view to the cliff and the sheer red rocks that looks to be on fire as they are lightened by the sun rays. In the second case, the 214 step-descending takes 10-15 minutes and it is not enough to enjoy the cliff view with the cave houses perched in it. The route seems short thanks to the scenery that surrounds the steps and to the sea one can see at the bottom. The steps lead to a small bay next to Ammoudi port where small boats and fish-caiques are ancored. There are afew traditional restaurants serving fresh fish at Ammoudi port. Given that it is close to Oia village, it is often full of people yet there several facilities for the swimmers. It is a small beach with deep blue water, located a few meters to the south of Ammoudi beach. It can be accessed by boat (from Ammoudi) or through 286 steps which begin at the marble street of Oia village. Armeni used to be the port where tourists arrived and then transferred to Oia by the donkeys. Nowadays, only small boats or private yachts anchor at Armeni which is ideal for swimming. What is more, there are a few restaurants on the beach serving tasty dishes to the swimmers.